4Easysoft Mac Video to MP3 Converter is one convenient and useful Mac video to MP3 conversion software which is good at converting various video/HD video to popular MP3 format on Mac, such as convert MP4 to MP3 on Mac, convert AVI to MP3 on Mac, convert MPEG, VOB, MPG, M4V, TS, RM, RMVB, WMV, ASF, MKV, 3GP, HD TS, HD MTS, MPEG2 HD, MPEG4 HD etc to MP3 on Mac. This Mac AVI to MP3 converter also supports other output audio formats like AAC, AC3, AIFF, AMR, AU, FLAC, M4V, MP2, OGG, WAV, WMA. What’s more, this Video Converter to MP3 for Mac offers you the access to get any time-length audio, set output audio parameters, preview source video effect, take snapshot etc. What’s new, you can add watermark as you like. With the assistance of 4Easysoft Mac Video to MP3 Converter, you can enjoy a different music world! 4Easysoft Mac Video to MP3 Converter converts video to MP3 on Mac, like MP4, AVI, MPEG, VOB, MPG, M4V, TS, RM, RMVB, WMV, ASF, MKV, 3GP, HD TS, HD MTS, MPEG2 HD, MPEG4 HD etc. 4Easysoft Mac Video to MP3 Converter also supports other output audio formats like AAC, AC3, AIFF, AMR, AU, FLAC, M4V, MP2, OGG, WAV, WMA. Make use of the Trim button to get your needed part to convert. You can specify the concrete start and finish time or just drag the slider bar. Modify audio output parameters by setting Encoder, Channels, Bitrate and Sample Rate in Settings window. You can also reserve well-customized settings as your own profile. 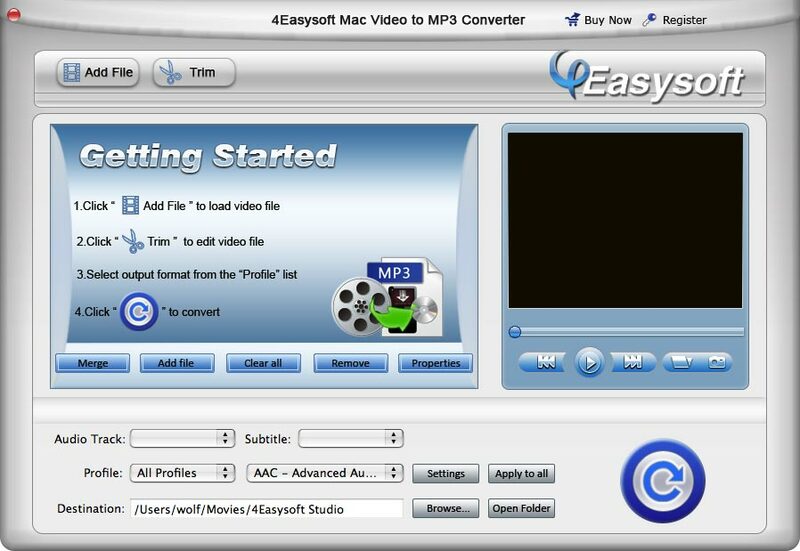 4Easysoft Mac Video to MP3 Converter allows you to preview the source video. Meanwhile, you can press snapshot to capture pictures from video. Add your favorite watermark to get a different effect. This 4Easysoft Mac Video to MP3 Converter provides you with different subtitle and audio track, so that you can choose your prefer ones. 4Easysoft Mac Video to MP3 Converter helps you to enjoy music successively by merging several files into one successive file. With super conversion speed and high quality, 4Easysoft Mac Video to MP3 Converter brings you the most convenient and enjoyable conversion process. Personalize your video by adding watermark. Special function of finishing several conversions at a time. Various subtitle and audio track supported.